The New Zealand born pianist Alan Broadbent has a long and storied career as a jazz man having played with the likes of Woody Herman, Chet Baker and Charlie Haden. But it is his orchestral accompaniment work with singers Natalie Cole and then with Shirley Horn and Haden that garnered him two Grammy awards. He is currently singer Dianna Krall’s musical director and has arranged and conducted strings for the Eagles Glenn Frey After Hours album and for Paul McCartney’s Kisses from the Bottom with the London Symphony Orchestra. The man is no stranger to using the magic a fully engaged orchestra can bring to a recording. Broadbent, now seventy, has been intrigued by a song he has had in his head since the early 1970s and the theme to that song emerges in three movements on his latest album Developing Story, released at the end of June of this year. Alan Broadbent’s love of some jazz standards is also on display as he deftly arranges Tadd Dameron’s “If You Could See Me Now”, Bill Evans’ “Blue in Green”, Miles Davis’ “Milestones” and John Coltrane’s “Naima” as well as his own “Lady in the Lake” and “Children of Lima” on this gorgeous album. Wanting the music to be true to its roots, he approached the music from a jazz trio point of view hoping that he could arrange a symphony orchestra around that core musical feeling. Jazz and Classical have been strange bedfellows over the years with some attempts to combine the two falling far short of their intended goal. 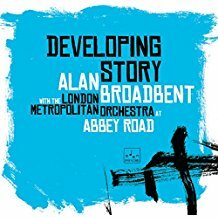 Broadbent may be the perfect scribe to join the two in harmonious marriage.The trio is a superb one that includes Broadbent on piano, Harvie S on bass and Peter Erskine on drums and the orchestra he envelopes the music with is the London Metropolitan Orchestra under his masterful direction. All three movements of Broadbent’s “The Developing Song” are cinematic masterpieces with gorgeous piano lines by Broadbent and swelling string orchestrations that carry you away in this haunting melody. MVT II is a slow waltz based on the same theme with the trio more in prominence and the orchestra brass and woodwinds providing some magical moments of suspense and grandeur. MVT III initially launches the song into more of a swing-like feel, Erksine’s feathery brushes leading the way, before a shimmering drum solo leads to some towering brass that soar majestically like Roman horns announcing the entrance of a conquering hero. The music just sweeps you away. Broadbent’s take on the jazz standards is equally as royal in its scope; his piano leads the way embellishing the melodies with lush orchestrations that are like miniature masterpieces of their own construction. To describe the nuances of his arrangements would do them a disservice, they are meant to be lavishly enjoyed; played on headphones with a glass of fine red wine or a dram of aged bourbon by your side. This is the good life in all its musical splendor. His arrangement of “Naima” is particularly luscious, a filigreed take on Coltrane’s ode to his first wife. Woodwinds dance to Broadbent’s call like wood sprites in a magical forest. He summons a gush of wind created by his marvelously arranged strings and boisterous brass. Like a master weaver he spins another world within the song structure. “Blue in Green” is another treat to hear as Broadbent envisions it in all its stringed and French-horned glory. The pianist in him loves the sparse beauty of this Evan’s melody, while the arranger in him hears layers upon layers of possibilities in this melancholic song. Broadbent’s unique arrangement of “Milestones” is like Gil Evans on steroids. The remaining songs are all gorgeous arranged and magnificently played. It may have taken the maestro nearly fifty years to get to realize his Developing Story but we are all the richer for him having finally completed this tour de force. Alan Broadbent - Developing Story (extended version) from Ralf Kemper on Vimeo. 'Bone Power: Michael Davis' "Hip-Bone Big Band"
Atlanta Drummer Dave Potter's "You Already Know"